A place where employees feel comfortable and connected - a place of transparency and communication. The 21,000 square metre complex consists of an office building with a smooth transition to the assembly hall. 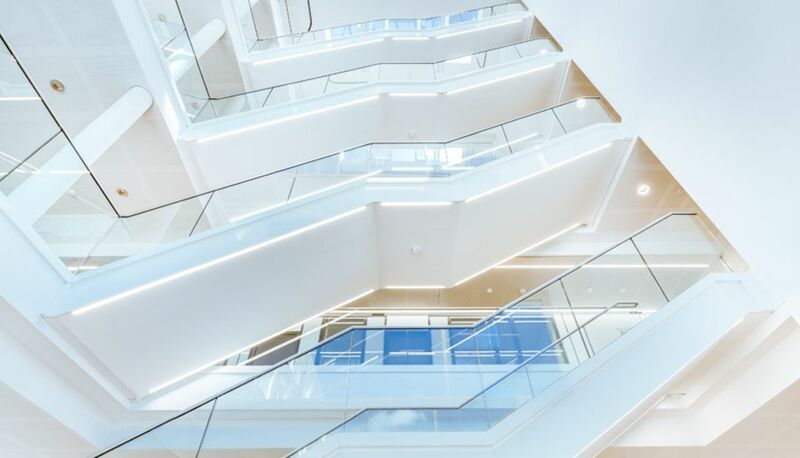 An atrium connects all five floors, on which 450 employees can freely choose their desks. 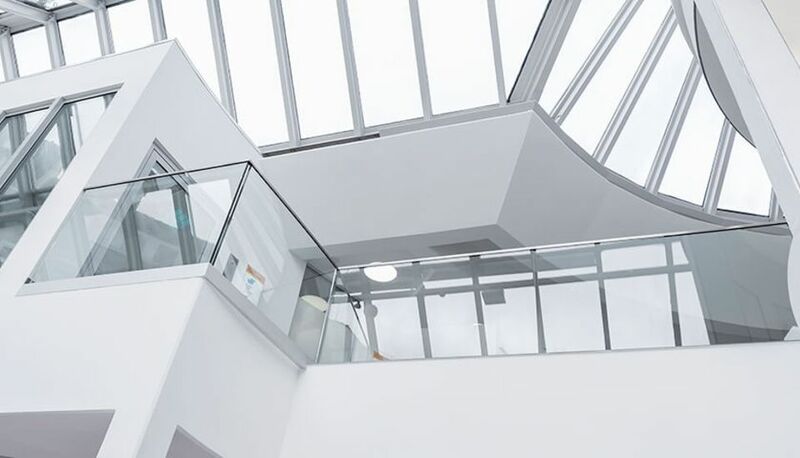 800 linear metres of the BALARDO core glass railing system by GLASSLINE were secured to the concrete ceiling and grant the employees both an unobstructed and safe view of nature. 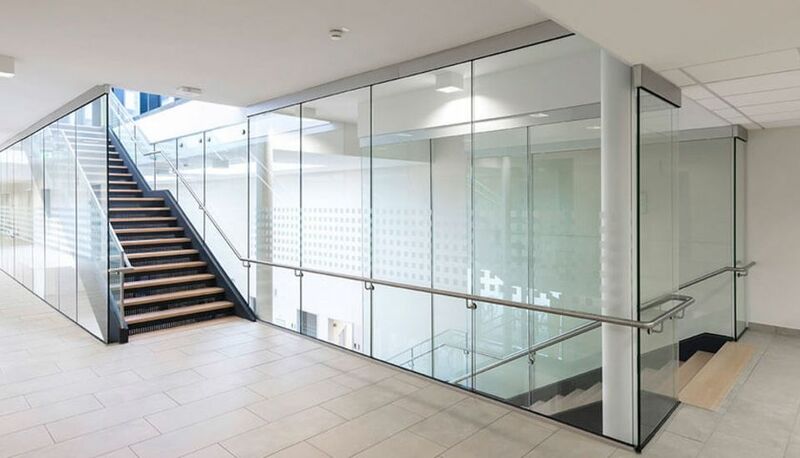 The glass railings consist of aluminium bearing profiles, a 20 millimetre-thick laminated safety glass pane made of 2 x 10 millimetre ESG with 1.52 millimetre film and a load-bearing edge protection. A school with a view! 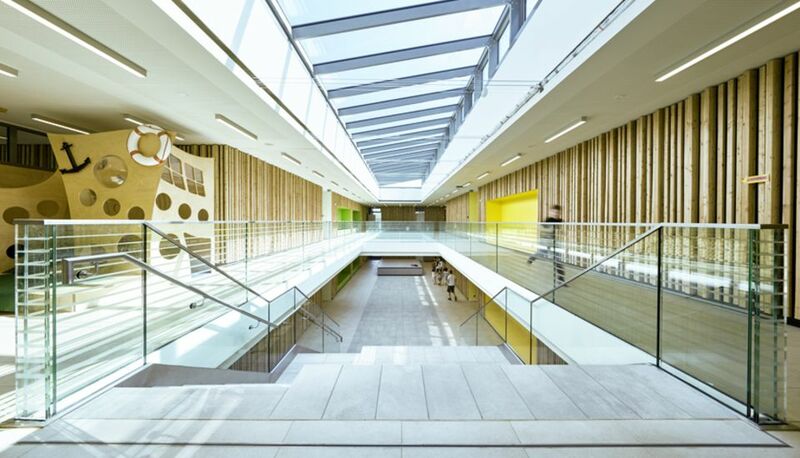 With 31 classrooms and specialist classrooms, the two-storey new construction offers a creative learning environment to approximately 500 schoolchildren from 27 countries. In the two-storey forum, a staircase leads from the event area on the ground floor to the upper floor, half of which is designed as terrace-like sitting steps. A glass railing runs upwards on the right and forms a circumferential glass gallery on the upper floor. 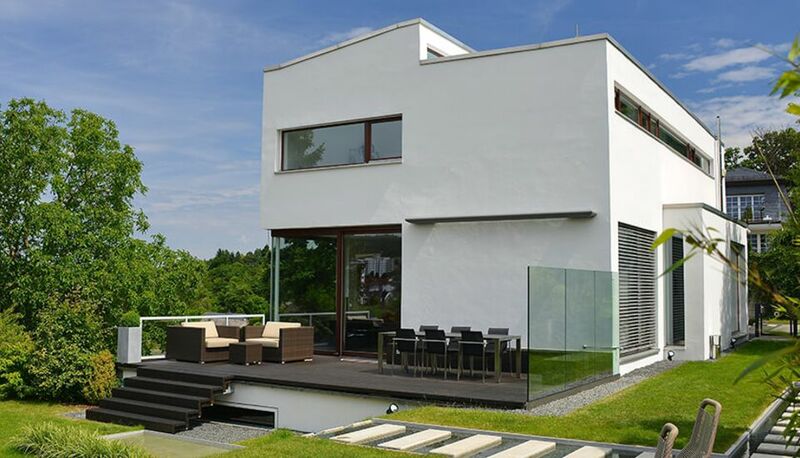 For this, the BALARDO steel all-glass railing system was used over a total distance of 80 metres. A special feature is the additional constructive handrail in the staircase area. 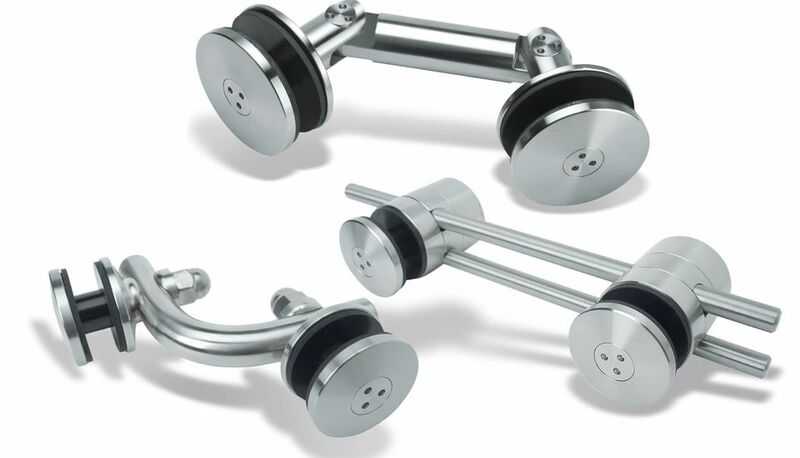 This was secured with point supports and offers children and adults a secure hold while climbing the stairs. The new construction of the headquarters for Leser KG in Hamburg took place from 2010 to 2016. The administration and test rig building are now consolidated in one location. With 180 m of BALARDO steel, the architects created the transparency and brightness desired by the clients both inside and outside. In 2008, GLASSLINE revolutionised the market and made all-glass systems in railing areas more attractive and economical than ever before. Through its fall-proof and ball impact-proof features, this glass railing is a safe bet both indoors and outdoors. The new Kirchberg-Pfaffenthal (Red Bridge) railway station was opened in the last year under the name "Gare Pont Rouge". A transfer platform was built to link the Kirchberg plateau to the railway tracks in the valley below and allow access to the city centre via the new tram system. BCM S.a.r.l, Echternach in Luxembourg used 2,800 POINT SUPPORTS (PH793) for the construction of the transparent station. 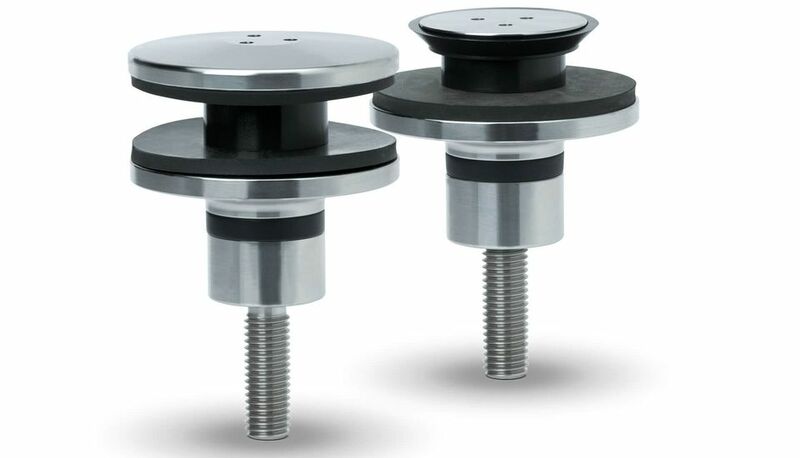 Many of these point supports were delivered as custom designs - with bearings and longer threads. 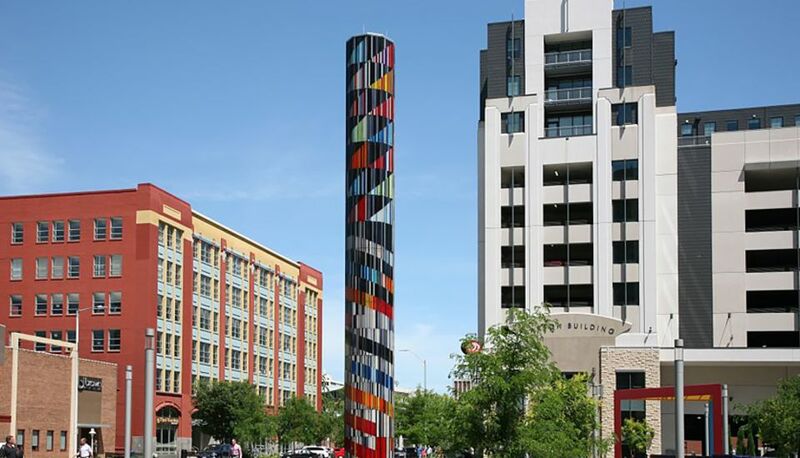 The "Search“ glass tower in Omaha in the US state of Nebraska stands as the lone structure in the centre of a large roundabout in front of the Fred & Pamela Buffet Cancer Center. The work of art in front of the large clinic specialising in cancer treatment was financed through anonymous donations. The surface area of the 120 glass panels amounts to nearly 170 m². Overall, more than 10 tons of glass and 720 point supports were used. With its transparency and colourful glass, the tower serves as a symbol of life, which gives courage to both the patients and the employees of the Cancer Center. With a striking combination of natural stone façade and light-flooded rooms, the building with its 23 apartments blends into the architectural environment dating from the nineteenth-century "Gründerzeit" and the 1930s. The all-glass guardrails of the balconies and loggias give the building a modern edge. BALARDO core as a system solution met all the requirements for maximum transparency, tested safety and fast installation with the CLICK’N FIX system. Its swift application without any bureaucratic red-tape allowed for a narrow time frame in which to complete the project. 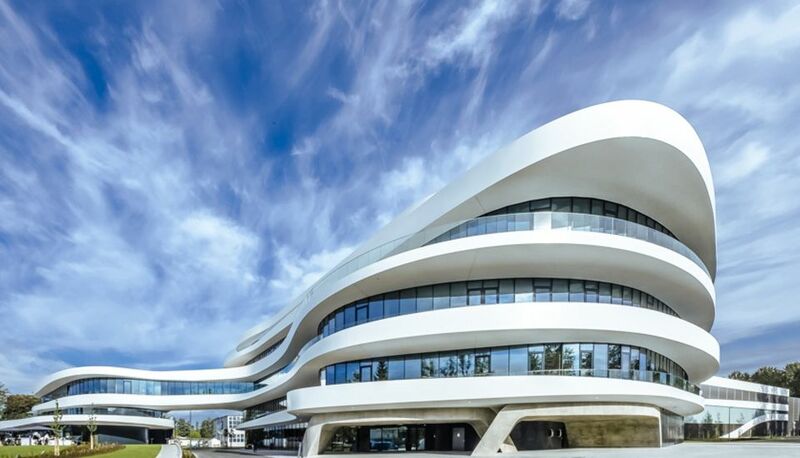 The headquarters of the transmission system operator 50 Hertz in Berlin was designed as an open and inviting building. An external supporting structure with zig-zag lines, designed to represent the frequency of alternating current, complements a recessed glass façade. 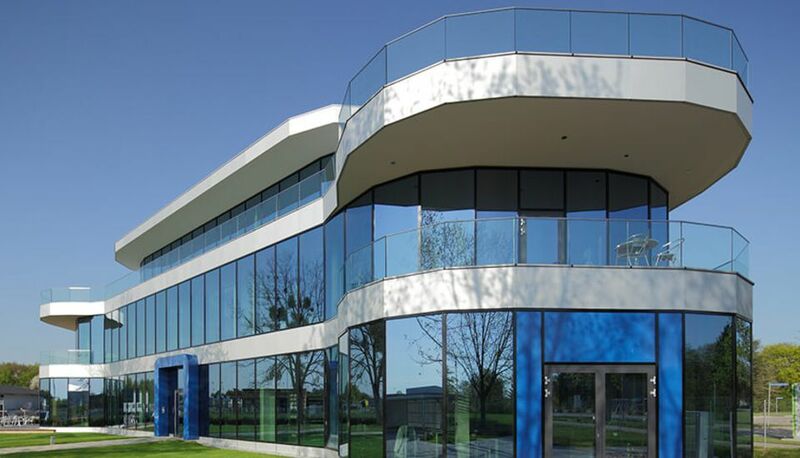 The BALARDO core side all-glass railing used for the balcony and loggia guardrails blends almost invisibly into the highly transparent façade and supports the light-flooded architecture of the large office spaces inside the building. Thanks to the vertical separation of the building structure and landscaped courtyards, the new Johannes social welfare clinic building blends harmoniously into the surrounding landscape. 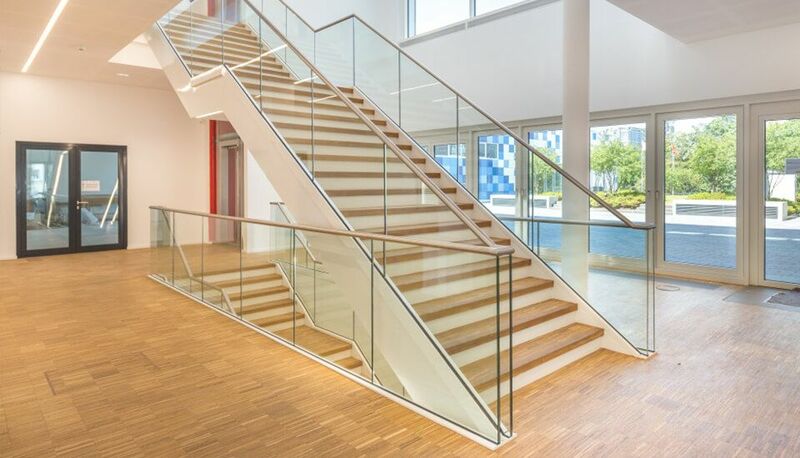 BALARDO alu glasswall was used on the staircase to create a well-lit, friendly and modern atmosphere inside. 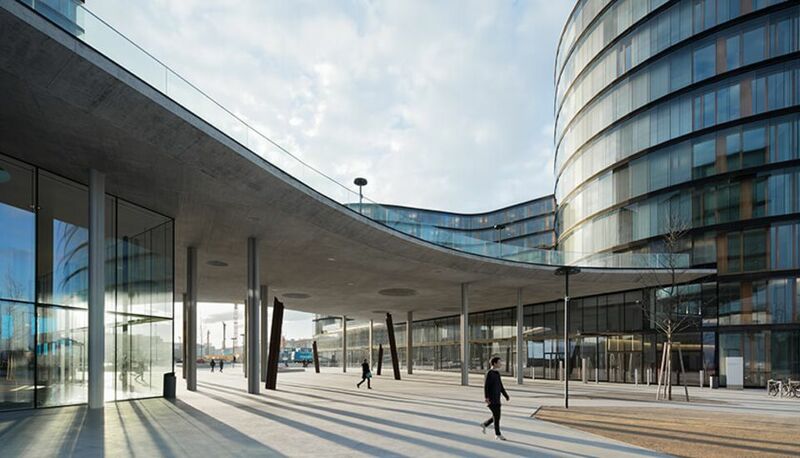 The fall-proof, floor-to-ceiling glazing with structural handrail is used on every floor and provides an unobstructed view of the entrance area. 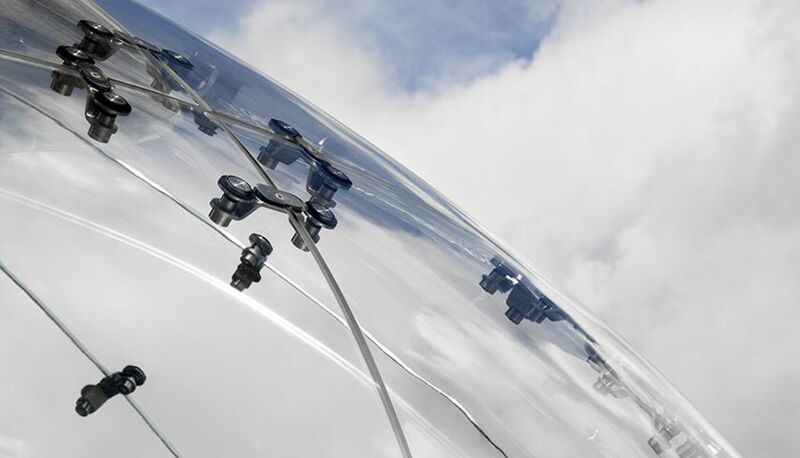 A highlight among glass canopies: the CANOPY cloud completely transparent, tested all-glass canopy system appears to almost float on air. The sophisticated design of the self-supporting glass construction emphasises the elegantly supported entrance door and was installed by a long-standing GLASSLINE customer in Sandhausen. For the Living Levels project, a captivating view through the floor-to-ceiling glazing had to be guaranteed by means of an all-glass railing. The railing of choice was BALARDO core. The sophisticated system delivers maximum transparency; the only visible feature is the thin, horizontal line of the stainless steel handrail. 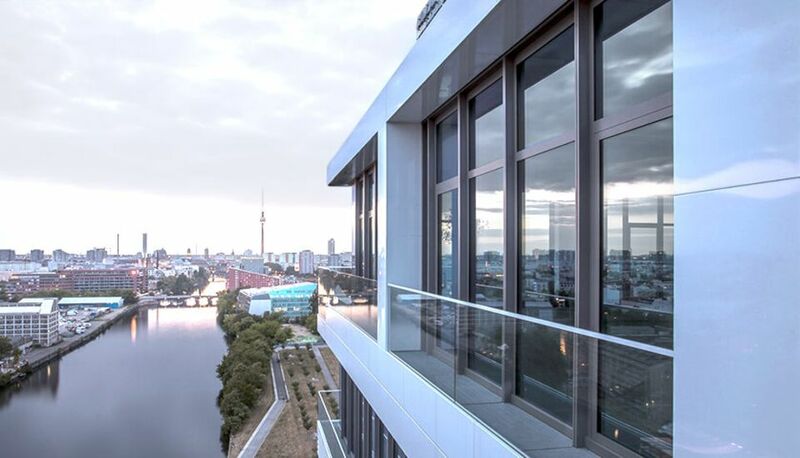 The approximately 900 m glass railing was installed according to the fast and cost-effective "Click'n'Fix" principle, whereby the glass is simply clicked into place and secured with a seal. BALARDO core was the clear choice with its unique combination of fast installation, tested safety and extraordinary flexibility. 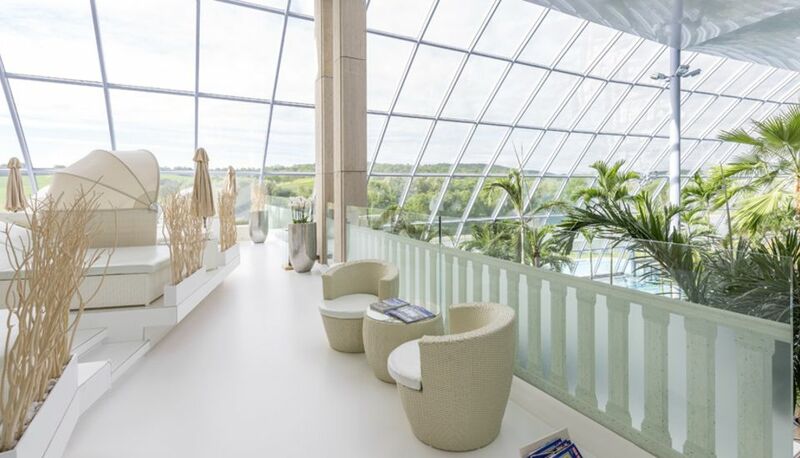 The Sinsheim THERMAL BATH & SPA, with the largest sauna in the world, promises an unlimited wellness and sauna experience. The architects were therefore faced with stringent requirements in terms of ambience, a sleek design and openness in the chill-out area of the sauna. The BALARDO core all-glass railing system ticked all the boxes. With its compact profiles made from high-grade aluminium, the transparency of the glass really makes an impression and creates an open ambience that is flooded with light. 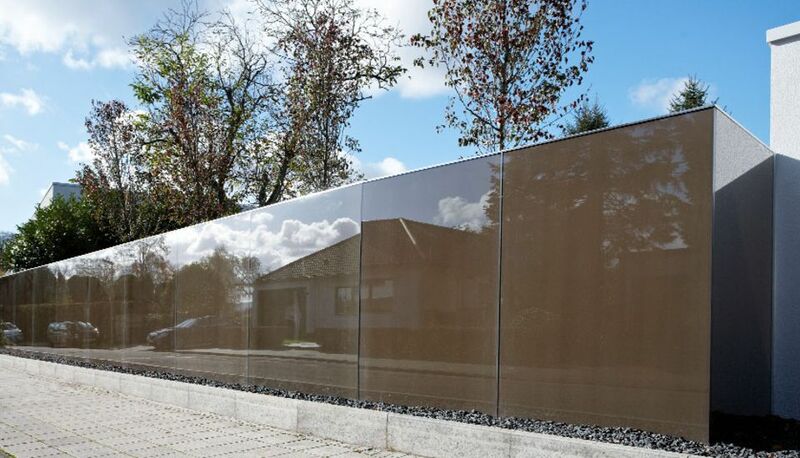 Opaque, elegant, space-saving and structurally tested - these were the requirements for the privacy screen to be installed at a villa in Karlsruhe to protect privacy. DAVENTO was used to offer the client a solution that met all requirements: the discreet clamping rail at the base holds the coloured panes of laminated safety glass securely in place, providing protection against prying eyes without any visible supporting structures. The construction concept for the Erste Campus is based on floating structures. 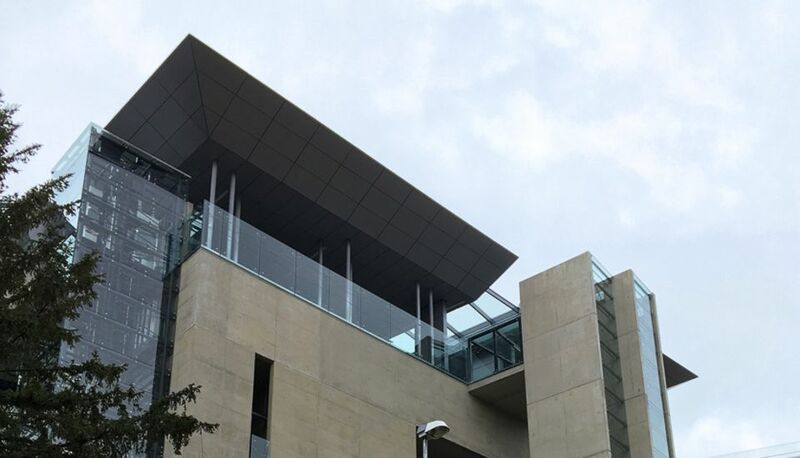 The building elements are connected on the outside by bridges, which incorporate and extend the impressive, contoured glass architecture. 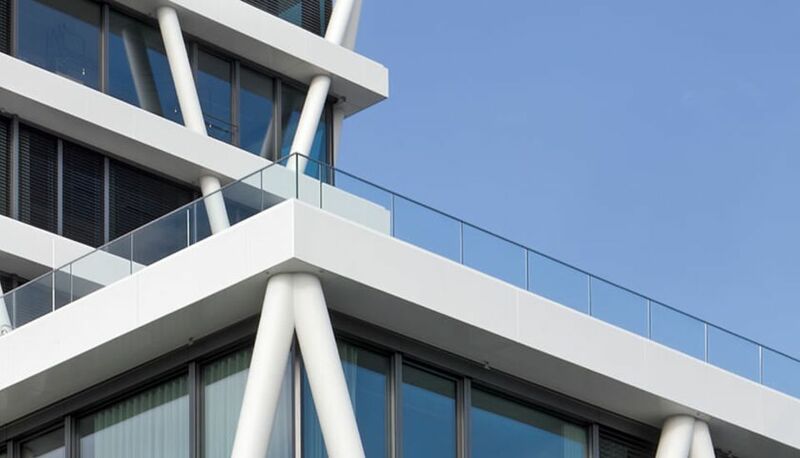 Fall-proof, curved all-glass railings were designed to complement the dynamic shapes and open building structure as highly transparent and discreet components. 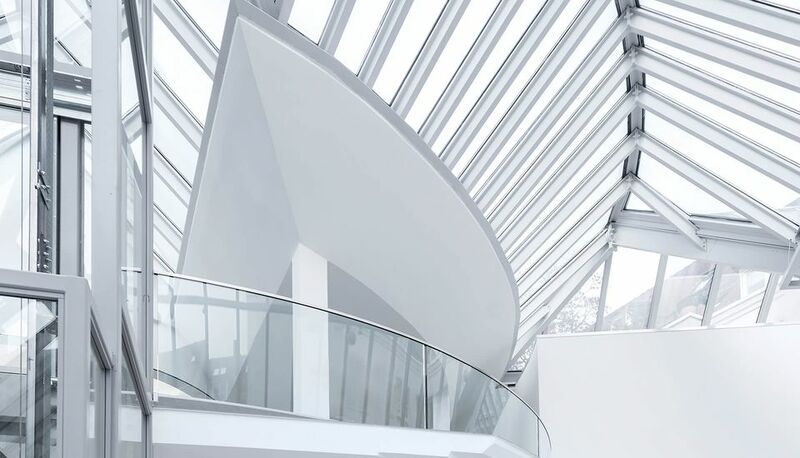 The combination of BALARDO steel (straight) and BALARDO wave (curved) proved to be the perfect solution for the high demands of both curved and straight shapes. The Käthchenhof is THE shopping arcade in Heilbronn, in the heart of the city. The purpose of the renovation was to make the architecture brighter, more modern and more open, as well as to harmonise it with the bustling city centre. 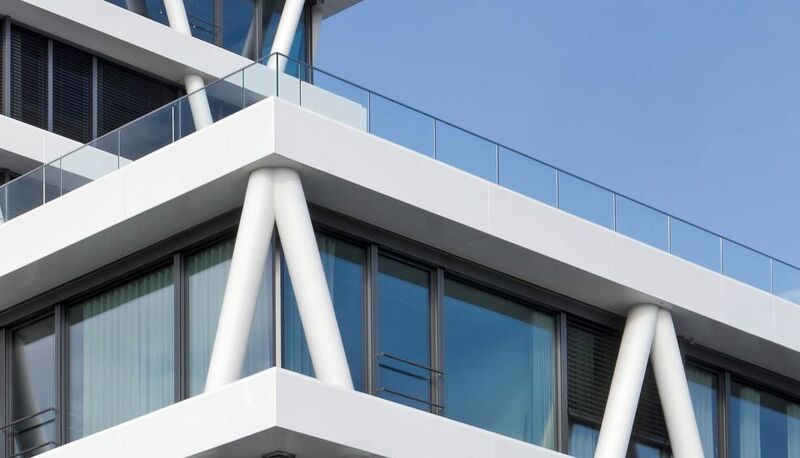 Transparent all-glass railings with a straight, contoured and curved shape were therefore the main components of the new architecture. By combining the BALARDO steel systems (straight all-glass railing) with BALARDO wave (curved all-glass railing), the stringent requirements were not only met but exceeded. 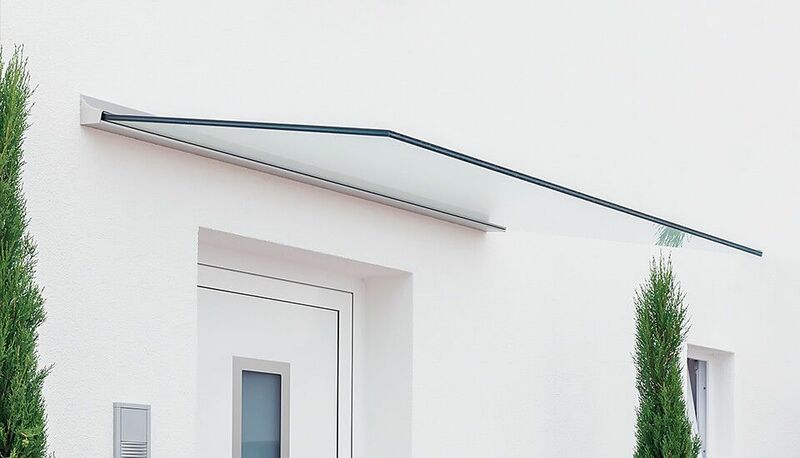 Clear lines and a high degree of transparency are at the heart of the architecture for a private new build in Neu-Anspach. 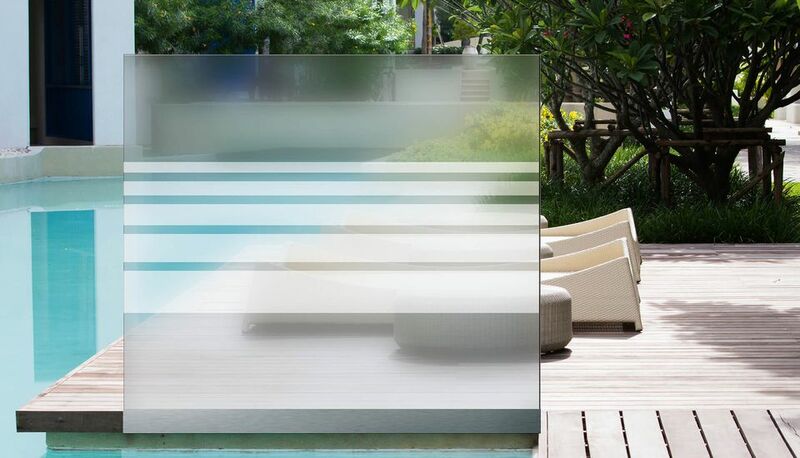 The DAVENTO wind and privacy guard system is a real eye-catcher, which emphasises the modern architecture with a high proportion of glass: made entirely out of glass and with no obtrusive posts, DAVENTO fits seamlessly into the minimalist design. The fact that GLASSLINE also provides a tested structural analysis for the DAVENTO system rendered the client speechless. Buchen town hall is characterised by its special sculptural architecture. 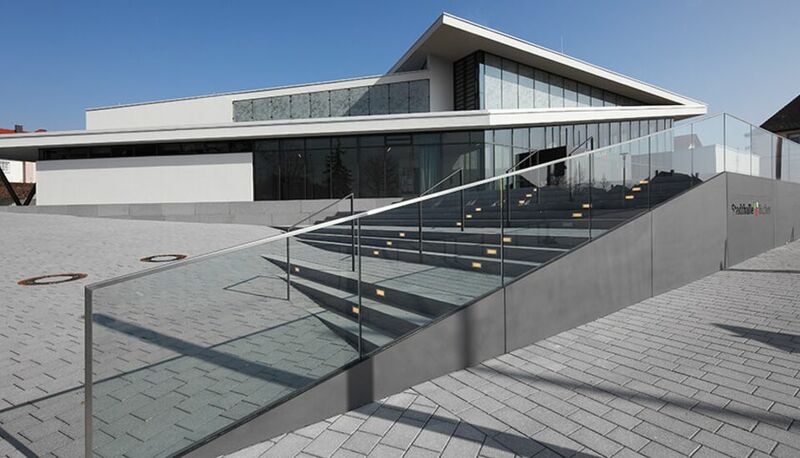 The BALARDO steel railing system fitted there, with its transparent and elegant design, emphasises the modern appearance of the event venue and turned this project into a real eye-catcher. This building reflects the core expertise of the MedXpert medical company: correcting the condition referred to as "funnel chest". With its rounded shape that narrows towards the top, the building structure represents the human ribcage. In this project, the BALARDO core all-glass railing was seamlessly integrated into the form of a demanding façade. This project was commissioned by a large German car manufacturer with the objective of creating an attention-grabbing product display. The oversized hourglass was placed in the centre of Red Square in Moscow. Filled with small plastic balls that slowly cascaded down, the vehicle hidden beneath them was gradually revealed. All POINT SUPPORTS used in this construction were fully custom-made, produced specifically for this project. 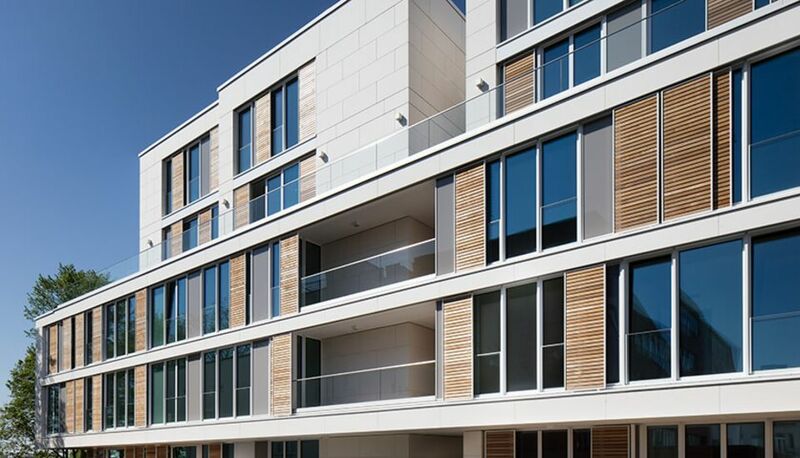 The project planners were able to rely on active support from GLASSLINE, as the company planned the entire construction in collaboration with an external engineering firm and both developed and produced the special point supports and connectors.